A Hardy France has unveiled a limited edition of 400 crystal decanters crafted by French crystal manufacturer Lalique. The decanter, entitled Printemps, contains a blend of Grande Champagne cognac dating back to the 1920’s. Designed to resemble a perfume bottle and packaged in a white leather case, the decanter is topped with a sculpted green crystal stopper inspired by Rene Lalique’s original design. A Hardy France began its decanter series in 1981 with crystal manufacturer Daum. The collaboration with Lalique began in late 2012. Printemps is the first in a line of four crystal carafes, each being released at two-year intervals. The carafes will be named after a season, those being spring (printemps), summer, (l’ete), fall (l’automne), and winter (l’hiver). The designs and colours of the future decanters won’t be disclosed until they are ready for release. Over the past three decades, A Hardy France has teamed with Baccarat and Daum to design carafes, so the collaboration with Lalique was a natural progression. 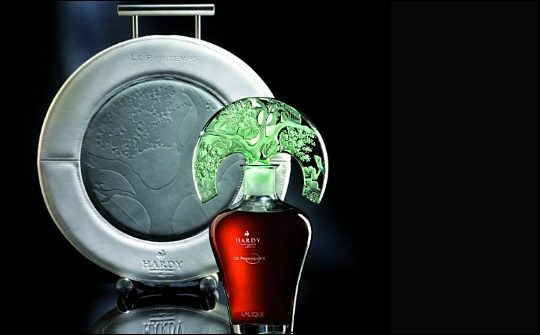 The partnership between Lalique and A. Hardy France has resulted in one product combining the famous names and reputations of the renowned crystal and cognac manufacturers. A Hardy Printemps crystal decanters are 75cl, 80% proof and are primarily aimed at the US, Canadian and China markets. Average retail price is US$14,000.